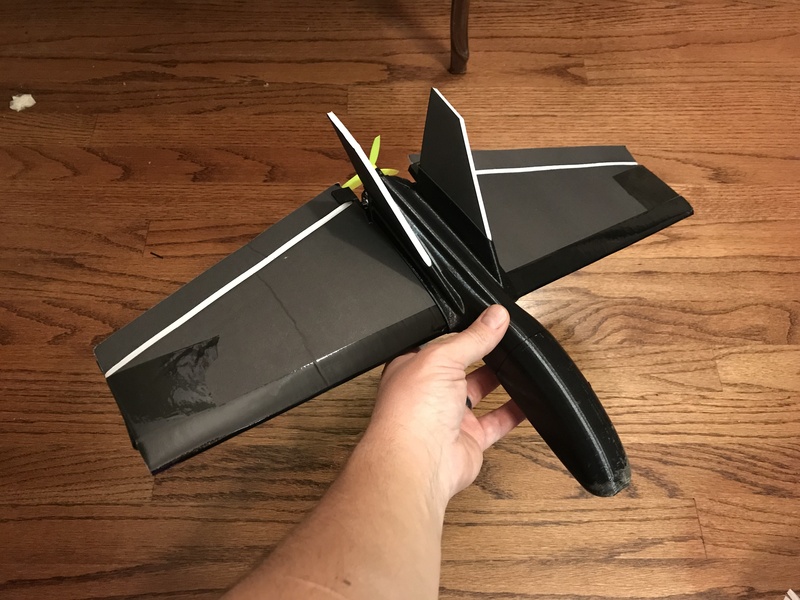 I'm designing a super durable 3D printed/foam board nano goblin style plane based on an 1106 motor (using one from my dart currently). I'm only running one motor and I'm looking for a bec speed controller that would clean up the wiring a bit. Any suggestions? I would reinforce the nose section of maker it a bit bigger, when it lands the nose will hit first and plastic doesn't flex too much before it breaks, looks really good though just keep in mind an off cg on planes like that have an enormous affect and it will want to fly fast. The nose actually pops on and off (to access the electronics and replace the wing), so in a rough landing it pops off instead of breaking. Surprisingly durable provided you nose it in realllly good (which I have done!). I have put some canards on it because it does like to be flown faaast! I'm able to slow it way down with the canards and still have good speed handling. I'm still tuning but I'm very pleased so far! Looks great, but why no videos ? Yeah we want videos! Not just flight but let's see some of that removable nose action too. I've had making a 3D printed body for my 75% Goblin on my someday list and I'd love to see what you've got there. I really like the way the vertical stabilizers are enclosed by the fuselage at the bottom, that's a real nice touch that probably eliminates all the flex in them. As far as small ESCs with BECs, I'd say the easiest thing to do is just stick a 5V buck board or LM7805 to a regular ESC and then just replace the 2 wire (GND/SIGNAL) connector with the standard 3 wire going back to the receiver with 5V injected on it. If you search eBay for "mini 5V buck" they have these tiny 20mm x 10mm switching step down regulators ("UBEC" as they like to call them in the RC world) that are perfect for mating with a modern tiny ESC and only cost about $1-$2 each. LM7805 / 78M05 are the BEC regulators you usually see built into ESCs and are like 10x for $2 although they get much hotter the more power you pull and the higher the battery voltage is. EDIT: Amazon has something similar 5x for $11, with the real key point being they have the solder jumper on the back to set a fixed output so you don't ever worry about brushing against the adjustment potentiometer and changing the output voltage.